Potato gnocchi are a fun, and delicious dinner. See how easy they are to make from scratch with this recipe. Notice that unlike many gnocchi recipes, this one uses no egg—a method that results in a lighter, more delicate gnocchi dumpling. Serve them with butter and Parmesan or the sauce of your choice, knowing that they are particularly good with rich creamy or meaty sauces. Scrub the potatoes clean and put them in a large pot (do not peel the potatoes). Cover with cold water and bring to a boil. Add enough salt to make the water taste salty. Cook, uncovered, until the potatoes are tender all the way through, about 20 minutes after the water has come to a boil. Drain the potatoes and let them cool slightly. Push the cooked potatoes through a ricer or food mill into a large bowl or use a paring knife to scrape off and discard the skins and thoroughly mash the potatoes with a large fork or potato masher. Stir in the flour while the potatoes are still warm—it will seem like it won't combine at first, but keep working it, it will eventually become a smooth, playdough-like dough. Divide the dough into four parts and work with one section at a time, keeping the other sections covered with plastic wrap to keep them from drying out. Roll a section of dough into a long, inch-thick snake on a well-floured surface. Cut this thin log into bite-size (1/2- to 3/4-inch) pieces. Take each dumpling and use your thumb to roll it down the tines of a fork, letting it drop onto a floured surface at the end. The dumpling will have tine marks on one side and a thumbprint on the other. This motion will take a few gnocchi to practice to get down but then is quite easy. Arrange the gnocchi on a very well-floured baking sheet or tray. Repeat with the remaining dough. Gnocchi can sit, loosely covered, at room temperature for several hours. Or, loosely cover and refrigerate overnight. When ready to cook the dumplings, bring a large pot of salted water to a boil. Add only as many gnocchi as can comfortably cover the surface of the water in a single layer. They will sink immediately. Give them a quick but thorough stir. Within about a minute they will float to the surface. Let them cook 10 to 20 seconds on the surface and then remove them with a slotted spoon. Place the gnocchi on a warm serving platter and repeat with the remaining gnocchi. 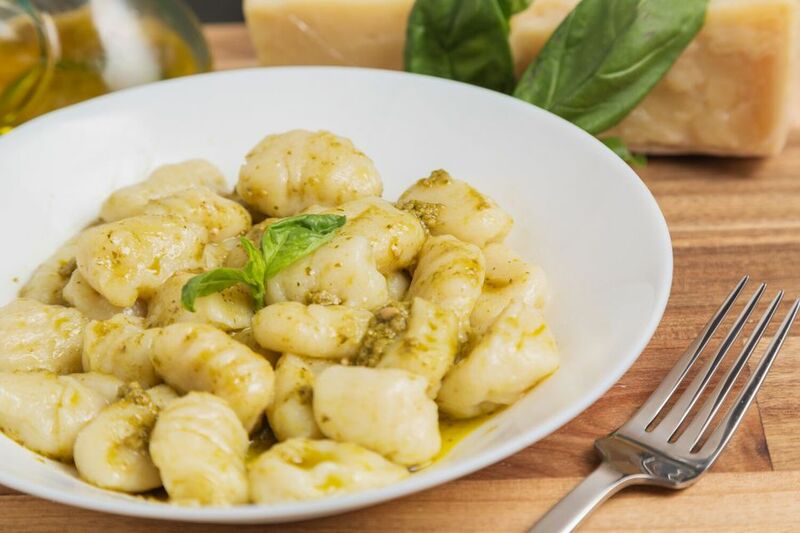 Toss the cooked gnocchi with butter, pesto, tomato sauce, or the topping of your choice and serve immediately. For longer storage, place the gnocchi on a baking tray and freeze them overnight. Once they are frozen, transfer the gnocchi to a resealable plastic bag and keep them frozen until ready to boil; they will keep for up to six months. Moroccan Seffa Medfouna - You must Dig In to Find the Saffron Chicken!